So while four Faithist perspectives came out of the Spe-ta cycle, there is also a fifth perspective, and it is more or less near a fully inwardly and upwardly oriented perspective but nonetheless cognizant of the outer realm and its requirements --- and that perspective was of the Center. One of its defining characteristics is that the outer realm in amount of attention and aspiration toward it, pales in comparison to that afforded the inner realm; in other words the inner realm milieu captivates the focus of those in this station / shrine. 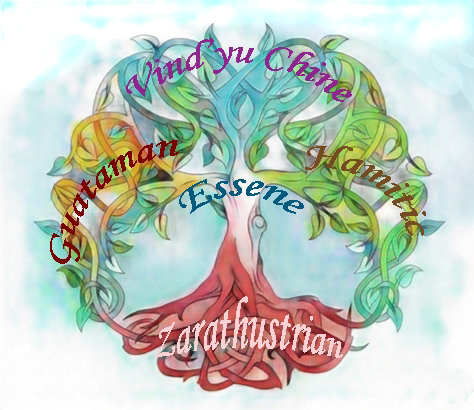 In its time, the Zarathustrian religion fulfilled the function; it would later be replaced in the Bon cycle by the Essenes, and meanwhile the Zarathustrian perspective now had moved more outwardly oriented, and the Vind'yu and Chine perspective became merged into one outlook but broader in scope than either of the two previous perspectives.) Thus toward the end of Bon the four outer perspectives were held by those with affinity to the Guataman perspective, the Zarathustrian perspective, the Vind'yu-Chine perspective, and the Hamitic perspective. The Center perspective was held by those with affinity to the Essene perspective. Four false Gods arose in Bon and each lay claim to certain perspectives: Ennochissa took the name Brahma and laid claim to Chinese, Zarathustrian, and Guataman heritages; his chief heavenly kingdom was over China with a subsidiary kingdom over Guatama. Kabalactes took the name Buddha and laid claim to the Vind'yu heritage; his kingdom was over India. Looeamong initially laid claim to the Hamitic heritage and so, took the names Lord and God, but ultimately took the name Christ; his kingdom initially was over Egypt and the Levant region with a wing over Heleste. Ultimately Thoth-Gabriel revolted from Christ and set up his own heavenly kingdom over the Middle East and eventually expanded east and west. Thoth-Gabriel chose to reclaim the Hamites and so, posing as a servant of Alah (meaning literally He who releases from the wheel) he raised up a su'is (Mohammed) who could receive the new teachings and preach them among mortals. This created consternation for Looeamong. Recall that he had already claimed the Hamites and had also laid claim to the Essenes' teachings. So, for his new religion he tacked onto the Ezra bible (Jewish Bible), previously written under his inspiration, the new Christian teachings (which borrowed heavily from the teachings of Joshu and the Essenes as well as from Zarathustrian teachings and other teachings of holy men in his region). These four heads of the beast (i.e., rulers of / over the animal nature of man) divided up the earth between themselves, and collectively laid claim to the whole of it (see e.g., 02/1.12). The inwardly and upwardly oriented Me-de-ans objected to various parts of the doctrines of the beast and so on that account cast out the heads of the beast in favor of the Middle Way. But it was the strait-jacket approach of these four heads of the beast that the outwardly and downwardly oriented Me-de-ans chiefly objected to, and so these too, in essence cast out the four heads of the beast in preference to the Golden Mean --- the Middle Way. Looeamong. on the other hand, was attempting to stop them from separating from Him. He understood about the strait-jacket and used it against the Me-de-ans by causing the government of the home country (Great Britain) to become domineering and so appear as a strait-jacket against the Guataman Me-de-ans. For their part the Me-de-ans had no desire to fight but if pushed far enough were willing to battle in order to come out of the old strait-jackets of the Beast. Looeamong pushed enough. This all took place this way because Looeamong had set out beginning in 1499 to despoil God's plans, as previously described. Had Looea not discovered at such an early date God's plan for redeeming the world, God would have been much better prepared for the machinations of Looeamong. In fact, had things gone according to God's original plan, the Guatamans in combination with the Inwardly and Upwardly oriented Me-de-ans would have created such an attractive core for the Father's kingdom on earth that the Outwardly and Downwardly oriented Me-de-ans would have fought off Looeamong or any other beast to protect that core. Because of Looeamong's machinations God took another course. His new plan brought the Outwardly and Downwardly oriented Me-de-ans to the fore while the core would be more subtly built only later to emerge into the ascendancy. In this emergence, the Center Shrine, that of the Essenes plays a large role. To see how, requires further examining the Center perspective's role. Their primary purpose is to be as a sort of glue that draws and holds all together interiorly into a unity. Connected with that is another labor of the center and that is to understand each of the outer perspectives by becoming one with each perspective. This creates the substance of the glue so that the Center Shrine may act as an assist or reinforcement to an outer shrine as required in keeping it on track and in harmony with the other shrines in their collective journey of upward and onward. Oahspe, Book of Sethantes; 05/11.3. And this was the land that the angels later called North Guatama, signifying the meeting of nations and the dawn of Kosmon. The meaning of this word [Guatama] is: Four Tribes United in One. The word Guatamala or Guatemala, would therefore mean: The Earth Place of Four Tribes of Men United in One. See maps of Central America. --Ed. Joshu, the Iesu and Prophet of Jehovih as well as the quintessential Essene, taught Jehovih's kingdom on earth and taught man the way toward it. As living exemplars, the Essenes, living communally in great cleanliness and purity and as brothers and sisters, began to live as the I'hins lived and therefore became in fact the final prototype for replacing the I'hins. The essence of this prototype became a core template that will come forth in greater and increasing potency as man progresses into kosmon. The labor of the past cycles being under the aegis of Seffas was chiefly for the development of the corporeal man; and now in Kosmon, man shall rise into his spiritual inheritance. That rise comes through that core template. To repeat and emphasize in a different way, the inner will only be fully reached and realized after the outer has first been fully reached and realized. And only then can the inner rise sufficiently to inspire the outer toward a higher, happier, more fulfilling condition. This has yet to occur for man. Another way had been available. The original plan of God for Guatama (before Looeamong discovered God's plan, which then had to be altered) was for man to approach the outside guided from the inside guided by a core developed from a union of Hamites and Guatamans, and so, man would naturally wean away from Seffas. But instead of a transition starting some 400 years before kosmon and developing to birth at the dawn of kosmon (i.e., 1449 + 400 = 1849 CE), the altered plan required the inner to broaden and deepen so as to rise from the disarray arising from the attempt to found the Father's kingdom from the outside, as happened in the case of the Republic social order. The conceit of the Republic social order (as formed in the condition and manner of its founding), was that once the outer was built and perfected, the order would then work its way inward and upward toward cleanliness, purity, and the virtuous life surrounded by wholesomeness and blessed with a generally uplifing, spiritually fulfilled, life --- but as has been proved, this does not work. The method of building from the outside first is akin to the kings and rulers forcing the Zarathustrian religion upon man as happened in the cycle of Fragapatti some six to nine thousand years ago, and the result of that was a fall into darkness and the creation of the flathead race (created in the attempt to force into man awareness of the inner realm (spirit, soul, perception of heavenly things). What came out of the soiled Republic template, is that the social order did not transition from Seffas to a Kosmon-based order, but rather continued to depend upon Seffas (enforced culture) for its momentum. But alas for that order, because Seffas, having yielded its place to Kosmon in 1849, ceased to actively enforce the old ways. Instead Jehovih allowed its momentum previously built, to carry man forth for a season. The ideal had been for Seffas to recede as man approached kosmon, but like an animal sensing it was about to be captured, the beast in man charged forward hoping to push past the presumed obstacle of Kosmon's gentle voice calling to him. Rudely he thrust her aside. The original plan in 1492 called for Guatamans and Hamites to commingle in community, each contributing their perspective and greater communities would organically grow from that. God knew Looeamong would sooner or later discover his plan, so the idea was to get the rudiments sealed in place so that when Looeamong perceived God's plan it would have been too late for Looeamong to destroy that foundation. But Looeamong inadvertently early discovered God's plan at its budding stage (as can be read about in Oahspe). Consequently Looeamong cut the plan short. He began by destroying the culture of the Guatamans and killing off as many of them as he could (through both his spirit minions directly - e.g., casting epidemics - and through mortals inspired by those minions). For over 100 years, Looeamong wreaked havoc while God suffered Looeamong to gain control over the south and central lands of Guatama. Meantime, God's new plan had been set in motion not long after Looeamong had discovered the original plan. Part of the beauty of God's revised plan was that to Looeamong it appeared as if God were stubbornly sticking to his original plan. Thus, when God inspired some Separatists (a type of dissenter from the Church of England) to migrate to Guatama, Looea was there: Of the ship that landed at Plymouth, only about 1/3 of the ship were Separatists migrating for conscience's sake where they could freely practice the dictates of their conscience, and 2/3rds were not, and these including a number of money-getters and warriors. And even years before that, Looea and his minions saw the angels of God preparing the Separatists for the eventual migration, and so Looea desired to place himself "at the head of the parade" and thus set the precedent by inspiring a ship to Virginia. The low grades of those who came over can be read about in the corporeal records. But Jehovih caused that mission to fail even as other earlier protestant missions inspired by Looeamong had failed to get an enduring foothold in North Guatama. God, Son of Jehovih, on the other hand, inspired others who were in essence upward and inward oriented Me-de-ans to emigrate to Guatama and he also inspired mortals with inventions and a desire to explore the lay of the world and others to leave the burdens of Europe and move to places where opportunity for self-advancement seemed better. In essence these were the outward and downward oriented Me-de-ans and because they sensed opportunity in Guatama for long-term conditions of enriching trade, they would emigrate to Guatama and claim the land. Those then, were God's workers under that revised plan. Meanwhile, instead of letting Guatamans and Hamites commingle in community, Looeamong caused mortals under his inspiration to make laws against European intermarriage with the Guatamans. And in fact, mortals inspired by Looeamong not only warred against the Guatamans and kept pushing them farther and farther from the Hamites (Europeans), but these darkly inspired mortals sought to lie, cheat and steal from the Guatamans so that these latter would reject any dealings with the Hamites unless they absolutely had to, and even then it was perceived as risky, even hopeless. But Looeamong inspired the Guatamans to war, too, even as he had been doing since the 1500s. In fact, it was Looeamong's plan to completely destroy the Guataman culture so that God's plan (as Looea thought it was) of commingling Hamites and Guatamans to achieve an uplifted race, could never work. But Jehovih is wise above and beyond the comprehension of the beast; and God, Son of Jehovih, being His ordained representative, labored in a way not foreseen by Looeamong. And the beast was and still is, destined to lose. For, God not only knew beforehand what Looeamong was going to do, but God understood how to subtly set in motion long-term events that would each culminate in its time (thus ripening in various time periods) all leading up toward Jehovih's kingdom on earth. The broad and deep core that had been forming began to rise toward Him Who is Almighty and All Love -- quickening in His great Wisdom. And those of the core began to coalesce. The inward and upward oriented Me-de-ans came forth manifesting in ever greater numbers --- beyond the capacity of the beast to stop them. And so was established the Fraternity social order. And in due season the ring of the Essenes began again to be seen, felt, aspired toward. For it is within that ring, that the Tree of Light manifests for man; and it is from within that ring the door opens to reveal the crystalline heavens and man's linkage to them. For even as the I'hins of old kept alive on corpor these higher Es-realities and so, lived for the sake of spirit, so the Essenes stood as their true replacement. And this gave anchorage, a true core for those holding the sides of the pyramid ---- those four perspectives of the shrines. And those of the 4 shrines gloried in the outer realm as experienced from the soul. And all these together built for Him Who made all ---- Jehovih, the I AM. But man is not yet there at the time of this writing. For, before the Essenes can much progress in their labor, the great gift of the Guataman shrine (perspective) to humanity shall manifest in myriad ways and come to be appreciated. For, because they lived for thousands of years without dictators and dictation, so they have become a power to assist those under the heritage of the East to learn to live as true brother and sisters. And as for the Hamites, their destiny is ultimately to change Ham to Hom(e). For, as the name Ham refers to their destruction of es-man prior to the Great Flood, and their subsequent destiny of redeeming barbarians, so the end of the destiny is to create that atmosphere which makes any place a home. The other shrines also have their destiny, but that is another account for another time. Although Oahspe does not give a time frame in which Jehovih's Kingdom on Earth will become transcendent among mortals, the beginning of its foundation (The Founding of the Republic by establishing the first resurrection for Jehovih's kingdom) and the beginning of the Kosmon era marks the official end of the reign of Seffas. Nevertheless preparations for Jehovih's Kingdom on Earth have been in motion even from the time of Sethantes, Son of Jehovih, who looked out upon the land of Thouri and left his soul's impression upon it. The Voice of Jehovih came to Yatonâ€™te [Lord God of North Guatama in the dawn of dan'ha of Fragapatti's cycle], saying [to those gathered at Yaton'te's throne]: Behold, O My Sons and Daughters, this heaven and this land shall not be like any other place; for here shall rise in time after, those who shall BEGIN the founding of My kingdom among mortals. For in the lands of the East, and the heavens of the East, I have given them Lords and Gods before whom they fall down and worship. But in this heaven, and this land beneath it, there shall not be given any Lord, or God, or any person born of woman for their resurrection. To this end I have created this subjective heaven and her plateaus, and they shall endure till the dawn of kosmon, and the overthrow of war and mortal kingdoms. From this throne [in Guatama] I will come in that day, through My Chiefs, and reveal the histories of My kingdoms. And I will radiate outward, around about from this heaven, until My kingdoms encircle the whole earth, and until the earthâ€™s heavens are Mine also. As can be perceived, the subjective heaven endures because man has not yet put away war. Neither has man yet put away mortal kingdoms. By mortal kingdoms is meant the opposite of Jehovih's kingdom, that is, mortal kingdoms refers to man being ruled by the governments of man in the style of Seffas, rather than by the government of Jehovih's kingdom. The Fraternity Social Order is the Transition Step in the progression between government by man and government by Jehovih. In the Fraternity Social Order, man will be in the organic first resurrection, which is in movement toward the second resurrection and its, among other things, rites and ceremonies. If you notice that the organic first resurrection seems like the Inward and Upward (IU) oriented Me-de-ans -- you would be right. But in the case of the IU Me-de-ans, use of the name Jehovih or even acknowledgement of certain of His attributes is not mandatory. What is mandatory is the willingness by the IU Me-de-an to follow their highest light and to be receptive to the inspiration of Jehovih (which generally means allowing for the possibility that some new light may supplant one's present highest light). In other words, the IU Me-de-ans will sufficiently follow the light of Jehovih so as to attain and sustain the Fraternity Social Order, which they shall found. Through prophecy and through study of cycles (especially of those given in Oahspe), we can learn of allotted times and seasons for man to transition from the Republic Social Order to the Fraternity Social Order. As of 2016 CE, we have entered the start of such a season, or rather one longer season with a shorter similar season within it. The short season runs for a spell from 2016 to 2049 CE: this readies the foundation; the longer season runs from 2016 to 2182 CE: this encompasses the course of acceptance and practice among humanity at large. Directly below the crown resides the hidden Sephiroth of Fraternity indicating the true brotherhood/sisterhood of man. As the man progresses in his spiritual development he attains to higher and higher forms of government. We can follow man's progression in the symbology of the Hi'yi tablet. Among other things, the middle column may represent various levels of man's governments. At the bottom we witness the earthy heritage in the rose. In the second lowest is the Cosmos, the Seen World depicting the purely horizontal where the only rule evident is the beast. Above the earth shines the sun. The brightest corporeal power known to man --- this symbol representing those individuals who were the monarchs, many of whom equated themselves with the sun, i.e., the Sun Kingdoms. Above the sun stands the three interlocked circles. 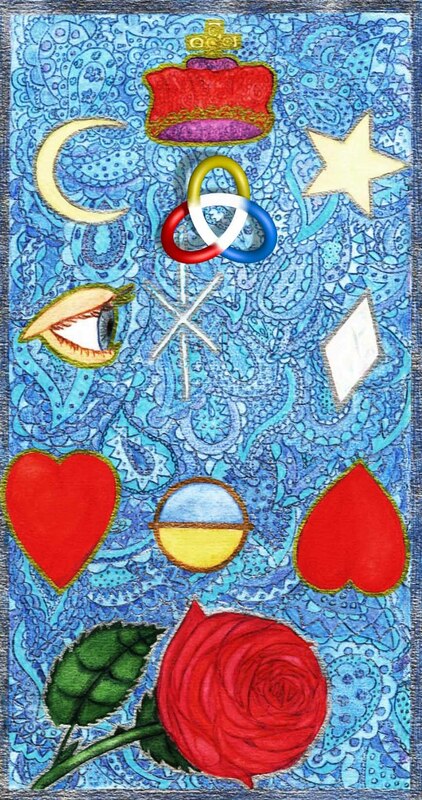 This emblem has been around since antiquity, most commonly known as the "club" in the playing card suites which came from earlier from tarot cards. The emblem signifies the true organization of Jehovih's kingdom, toward which man emulates. The requisite foundation for entry into this condition is called Fraternity, which is the condition of each person regarding all as brothers and sisters---regardless of whether or not these are members of either a particular fraternity /club or none at all. The entry hall of Fraternity is gained by aspiration and practice of this exalted condition. To attain beyond the entry hall so as to enter in toward the main body requires constitutional growth based upon among other things, a vegan diet and the putting away of war. Fraternity has been in embryo since 1882 and the pregnancy is due to make itself known to the world. But just as embryos are protected and hidden from sight until late in the term, so this condition will develop toward the time of its birth. And the due date for the birth itself is the dan of 2049 or not long after it. Bear in mind that after the birth of the Republic social order (which is the main preparatory social order to Fraternity) so Monarchies endured for a season after that birth. Even so will Republics not suddenly disappear after the birth of the Fraternity Social Order. In the Hy'yi Tree of Light the Republic social order can be considered to be sitting in the vertical line above the crux of the sun symbol. The republic is close enough to see the Fraternity above it, but the lure of the diamond to the right often captures man's attention and tends to keep him from rising in the Tree of Light toward Fraternity. Above and over all stands the Crown condition which, when man attains to, is Jehovih's Kingdom on Earth. For, Jehovih is the Crown, and therefore it is JEHOVIH'S Kingdom on Earth. In Jehovih's heaven His crown descends to the office of God and to the office of Lord. These ordained representatives are those who head the Fraternity of the Red Star (brotherhood and sisterhood of all man---angels and mortals, of which the earthly fraternal social order on earth will be an imitation until Jehovih's Kingdom on Earth is fully established). That is, at the appointed seasons the crown descends to the one person of highest grade in the heavens of the earth for the coming dan-span, who then becomes the new God. Following that, the Lords are crowned. This change of administration will occur at the end of the 2049 dan (remember, dans have a duration of a certain number of years). Jehovih's kingdom on earth is an extension of the government of heaven to the earth. But that shall occur only after man has grown organically in the Fraternity social order. For those who think they may be ready for Jehovih's Kingdom on Earth, ask yourselves, can you uphold in the ways of Jehovih's kingdom, the three sacred lights and the holy center as shown in the Fraternity emblem? How does the Guataman shrine help? Their thousands of years of practicing and keeping the animal man (beast-man) subservient to the spiritual man (es-man) has given them an automatic power to subsume the beast to the es. By their presence, man from other cultures learns also to do this. All other cultures had Gods, Lords and Saviors to whom man was subservient; in short, he was forced to submit to a dictator and even tyrant. This subservience became a part of his normal response rather than defiance. But as for the Guatamans, recall for instance, from Oahspe, that because of the teachings of Eawahtah being taken to heart, there was in Guatama among all the millions of Guatamans NOT ONE DICTATOR or TYRANT among them (see 28/10.12). For that reason they have a great power among the peoples of the earth who have lived under false Gods and false Lords and under Dictators and Tyrants, for by their behavior, the Guatamans open the way for man to move beyond such Dictators into what would otherwise have been a void and likely a fearful void. By their behavior they teach man to automatically have good will and trust when meeting another rather than unwarranted suspicion and caution. This is extremely important in the time near at hand because man has been saddled by the beast with a carnivorous habit and though man (especially the aspiring Faithist and the IU Me-de-an) will early on change his diet to an herbivorous, i.e., vegan diet (no animal substance whatsoever), he will still need to change the deep-seated behavioral habits that came from the animal-substance diet and subsequent mindset, such as overwhelmingly intense or demeaning passions, quickness to anger, contention, jealousy, love of vengeance, blind irrationalities, and general cloudiness, all of which get stirred by the beast (see e.g., 34/12.12). And former meat-eaters and animal substance consumers create within themselves proneness to those things which can be and are triggered even for a long season (though diminishing over time) after becoming vegan. Moreover, if one's ancestors ate meat, the matrix of your body was formed from them and afflicts the spirit with inherited weaknesses. Yet it is true that Jehovih allowed many I'huan tribes of Guatamans to practice to the carnivorous habit, although they depended upon a wide range of plant-based foods - both gathered and cultivated; and for the most part were agriculturalists prior to the arrival of the Europeans. But with the devastating effect of Looeamong's minions as they attempted to destroy the Guataman culture and the displacement of the Guataman tribes and nations, caused a surge in the carnivorous habit among the Guatamans. And in this turn of events which increased the affects of the carnivorous habit, they relied deeply upon the inheritance from their ancestors to keep them in the groove of making the animal-man (beast-man) subservient to the es-man, or as they might say, honoring the Great Spirit (i.e., placing the Great Spirit first and last in their consideration). Jehovih's angels and ashars were also able to assist in upholding the spiritual qualities of the Guataman I'huan tribes due to other factors and for good reasons. Such factors include Jehovih's endowment of lasting peace and goodwill among the tribes through Eawatah's legacy (some 6000 years ago); the ensurance that no false gods could entrench themselves sufficiently to control to any significant effect either the North Guatamans or the North Guatama heavens. Also the effects of dark and light periods for the Guatamans were such that they neither fell into long term anarchies and hells (as occurred regularly in the regions of the kingdoms of the false Gods in the east), nor would they reach such heights in time of light that they abandoned the corporeal world. And because those experiences, over millennia, became a part of their make-up, such factors allowed/allow for the Guatamans to keep the way of goodwill and harmony open even to meat-eaters and especially for those ceasing that habit. In that regard, though, bear in mind that in this present era Jehovih has made animal substance poisonous to man. And the time is soon upon us when the atmospheric milieu will be conducive to the infusoria (microbial life-forms, germs, viruses, bacterias, etc.) and detrimental to the consumer of animal substance. This is because man's body cannot expel all the created poisons from the animal substance and so must store the poisons in man's body. The labor of many infusoria is to act as Jehovih's microbial cleanup crew to recycle poisons but, which in the process, can create waste products perhaps even in greater abundance and which are just as deadly or deadlier to man than what they are cleaning up. The only enduring and sustainable cure is for man to change his diet to vegan. For which reason, even the inheritance of the Guatamans, or anyone else's for that matter, will protect them from the infusoria if they allow animal substance within their body. Thus in this Kosmon era, nobody gets a free pass regarding Jehovih's commandment for man to become herbivorous men and women of peace. Another labor of the Guatamans is to help man to move beyond his predisposed and deep-seated savior complex. In summary, however the general outline presented gets filled in by the details of what shall occur as man progresses into kosmon, one thing is certain, progress toward Jehovih's kingdom on earth shall occur in due season and man shall fulfill his allotted time by laboring toward that end, till, at last it shall have manifested in its fullness. So as we go forth, we remember that to rise in the light is to take care that we rise in such a way that unites with other light, so that the resultant light is made ever more potent for the glory of Jehovih, and His Kingdom to come in its fullness. This is the reality that man is moving toward, and none can stop him in the Hand of the Almighty --- Jehovih The I AM! May we all rise to receive the blessings of Es.